Almost 100 people turned out for Friday’s mid-day ceremony honoring veterans of the Vietnam War at the Highland County Veteran’s Memorial in Hillsboro. Shirley Wilkin, left, whose brother was killed in Vietnam in 1968, delivered the keynote address. At center is Col. Ronald Sampson (U.S.A.F/Ret.) and at right is Highland County Veterans Honor Guard representative Gerold Wilkin, both Vietnam veterans. Flags flew at half-staff during the proceedings that started at noon Friday, designated by President Trump as National Vietnam War Veterans Day in a bill signed into law two years ago. Wilkin said that the names of two other soldiers not on the memorial would be engraved on it, those being PFC David McConnaughey, who is listed with a military home of record in Lebanon in Warren County, but who was actually from Hillsboro; and Cpl. James Waulk Jr., who is originally from the Greenfield/Rainsboro area, but whose military home of record is listed as Washington C.H., due to the fact that was he and his wife were living there when he enlisted. The Highland County commissioners issued a special proclamation for what President Jeff Duncan called National Welcome Home Vietnam Veterans Day, recognizing by name the 10 soldiers that included McConnaughey and Waulk, who were the first and last soldiers from Highland County, respectively, to die in the war in Southeast Asia. Keynote speaker for the ceremony was Shirley Wilkin, who shared with the crowd memories of her younger brother, Army PFC Mark Hook, who was killed by friendly fire in South Vietnam on Aug. 28, 1968 after only being in-country a little over one month. Hillsboro mayor Drew Hastings, who at 65 years of age vividly remembers the war in Vietnam, said that Friday’s ceremony was both a proud time and a sad time. 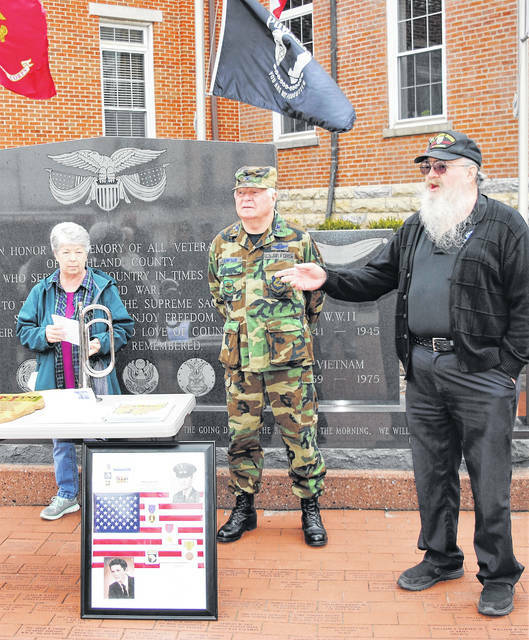 https://www.timesgazette.com/wp-content/uploads/sites/33/2019/03/web1_Wilkin-Sampson-Wilkin.jpgAlmost 100 people turned out for Friday’s mid-day ceremony honoring veterans of the Vietnam War at the Highland County Veteran’s Memorial in Hillsboro. Shirley Wilkin, left, whose brother was killed in Vietnam in 1968, delivered the keynote address. At center is Col. Ronald Sampson (U.S.A.F/Ret.) and at right is Highland County Veterans Honor Guard representative Gerold Wilkin, both Vietnam veterans.